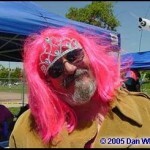 I first met Brian Champie at Kite Party #1 in Huntington Beach. This big Teddy-Bear of a man seemed like an especially nice guy, though a little quiet and even a bit shy. It was only afterwards that I discovered that Brian was really one of the “forces” behind the scenes in many facets of West Coast and California kiting… Over the years, I’ve been fortunate enough to run into Brian at various events, including WSIKF – where he’s always flying, and he always has some quiet wisdom to offer that’s “right on,” like as not. You only have to listen. Well Brian, here’s your chance… We’re listening now! Okay, Brian. Let’s start this interview off the easy way. How did you first get started in organized kiting? When did that happen, what got you started, and what really grabbed your interest so that you stayed? In May ’92 my sister gave me kite for my birthday, a 45 inch Skynasaur Aerobat, complete with control bar. Then in early July my girlfriend at the time, my sister, and a friend of hers and I took it out to the coast and had so much fun crashing, launching and laughing with that silly kite, I was hooked. We even stuck it in a Pine tree! Then a few weeks later, in the Sunday paper, I saw an article on the Berkeley Kite Festival and I had to go check it out… I bought a real kite that day, and they still give me a giggle! Once you got rolling, who did you fly with and who acted as your teacher or mentor? Did you join a club, or hang out with a group of fliers, or just fly alone? Well at first I flew alone… I spent every spare second learning how to fly that thing and was a bit shy about it, so I usually went as far away from people as possible to get my fix! 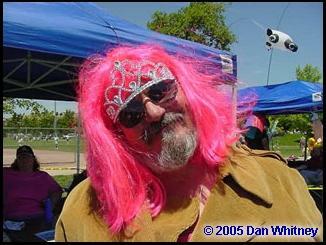 It wasn’t long before I was a Berkeley regular, and hung out with the huge group that flew there regularly. In those days, any weekend you could find 20 or 30 kiters out there… I wonder where they all went? I envied the guys that were flying Miguel’s California Wasp, and soon had one of my own. 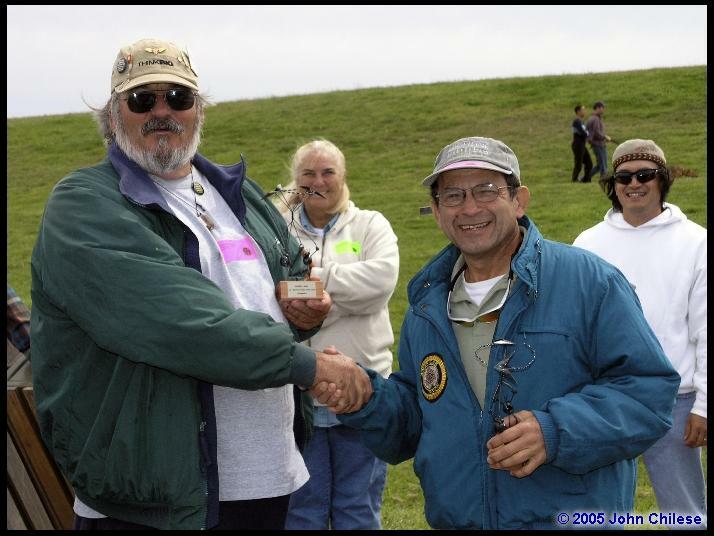 Guys like Miguel Rodriguez, Kobi Eshun, Bruce and John Morrison, and others influenced me and my style of flying. 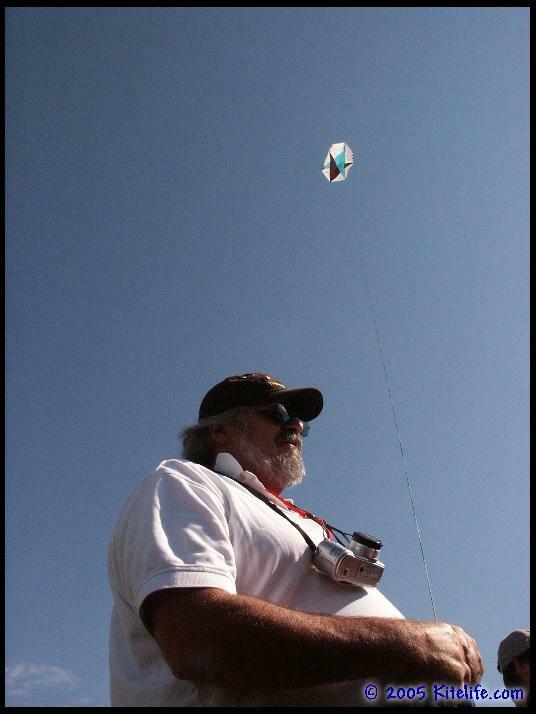 Regardless of who you hung with, by now you were intoxicated with the “Joy of Flying.” Tell us a bit about how you felt with a kite in your hands, and how it changed your outlook. You could say I was obsessed with mastering this kite thing. I spent all my spare time out in the park. I was self-employed and often took off early and went straight to the park. I remember my heart rate would actually raise as I neared the field. I even lost weight AND a girl friend that first year… I remember her saying “If you spent as much time learning how to have a relationship as you do leaning to fly a kite…” She left soon after! Sooner or later, you got to the point where you wanted to compete. Was that a natural outgrowth of flying, or did someone approach you directly to start competing? There’s some fairly interesting stuff on your website Brian, but not too much about your early competitions or about your first pairs-team, Air Berkley! Tell us about your early comps, Brian. Competing for me was NOT natural. Miguel and others encouraged me to try it for quite some time… I never felt I was good enough or understood the ballet thing… AND, I was too shy!! 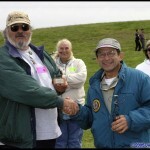 I started in Experienced class and had some success – even a second place at Nationals, then went to Masters class. The guys ‘n’ gals in Masters were good, and every outing I could count on a 5th or 6th place. It seemed for years the same 3 or 4 guys traded the top spots. I forget what year it was when Greg Aronson and I paired up to make Air Berkeley. We rocked that year, and were only beat by Dos Avispas (sadly) at the end of season. When the invitation to Nationals came, Greg quit, and I still feel like he left me at the alter! We put a lot of work in and he simply walked away. I still don’t know why! 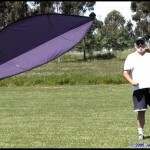 Okay – by this time, you’re firmly entrenched in the Sport Kite competition scheme along the west coast. And about now you should have gathered some sponsors, and be well on your way in that regard. Tell us how the sponsorship deals got started and what all that entails. I was on a 4 man Wasp team. We got Skyshark sponsorship for the team and soon I was also sponsored individually. In the early days, Erez knew that some of us Berkeley fliers were “hard” on rods. 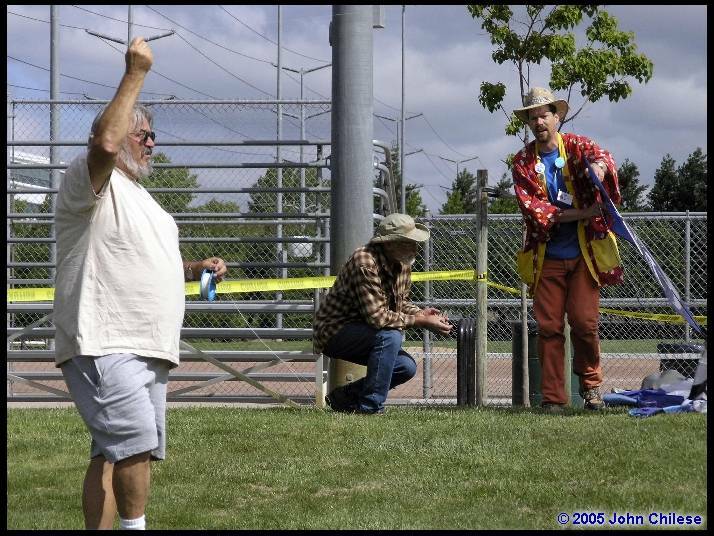 He was developing some great sticks and we were “testing” them for him… I still use Skyshark! The Laser Pro deal was funny. 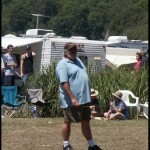 I was flying at the Washington Festival – flying my usual “whack it” style. And this guy came up to me and said, “You fly like you mean it. I want to sponsor you!” I had a Laser Pro banner and pamphlets and all the line I could eat by the end of the day. Still using laser pro too! That Guy was Konrad of Laser Pro. A big thanks to Skyshark, Laser Pro, and Miguel Rodriguez for being so good to me and contributing to my good ride! There’s also some stuff out there on your site about you being a real “trick innovator.” So fill us in Brian… What stunts have you devised or created that pilots are using today, and how did you come to originate them? This question always provokes controversy, as tricks were being developed all over the world. I am known for being the first to do what I used to call the lexa (axel backwards). It’s called a kick turn or “half axel” turn now. The Cascade is also my spawn. The tip toe is another. There were a few others that nowadays don’t even seem like tricks, like I was the first one in the park that figured out how to do a left then a right axel… I called it a left-right… No big deal now! I gotta say it is very satisfying to see these tricks being done… I don’t even care if they know where they came from! Finally, you’re recognized as one of the “hot” pilots. I’ve heard various references up and down the west coast to the “Berkley School of Flying!” I’m assuming that’s referring to your “whack it” style of flying, meaning, decidedly NOT gentle, right? So how did all that come about? Oh no, I am not responsible for the “Berkeley Style.” I only took it seriously and learned and loved to beat the crap outta my kites. Miguel can be blamed completely for that style of flying. He developed a kite that could be whacked and flown in a very aggressive style. I still love the power and speed of a California Wasp! By now you’re really pretty integrated into the competition scheme. What did the associations with other pilots, this “camaraderie,” mean to you? And who were you always competing against – anyone still flying today? Ah, Yes… The community of kiters became family, sharing most everything… kites, food, parts, rides, anything. Kiters are great! Miguel is the only one left still competing, while others are involved in organizing, and most have moved on to who knows what! Finally, you teamed up with Miguel Rodriguez as “Team Avispados” after Miguel’s earlier “Dos Avispas” disbanded. You and Miguel have pretty much been together as a pairs team ever since, right? Tell us about Team Avispados and what flying with Miguel has meant to you over the years. Flying Pairs with Miguel taught me discipline. Pairs flying brings it to a different level. Both my Ballet and Precision scores started to rise after pairing up… Avispados had a good long ride, and we were somewhat successful, but never did manage a national Ballet championship. Sadly, I never could live up to or fly like Kobi, and was a constant disappointment for Miguel. At the beginning of the ’05 season Avispados quit competing and now we just do demos, ending a fun 7 year run. Somewhere in here, you got a chance to go to Columbia and fly. How did that come about, and who went with you? Did you have a little fun down there? Oh my god, yes! Those 2 trips to Colombia were fun! Man, that’s waaay outta town, ya know? 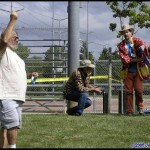 There is a group there that puts on a kite circus of sorts, and takes it to 4 or 5 cities in the 2 weeks. It’s like being rock stars! The people crowd ya for autographs or just to stare at an American. The audiences are the most appreciative I’ve ever flown for. They scream their lungs out when ya just launch or crash or wave to em!! We got to see lots of the country, enjoyed the people, and never saw any crime… Of course, all those guns ‘n’ rifles might have something to do with that! I’d go back in a heart-beat! 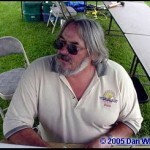 Now, those of us that weren’t lucky enough to meet you before the turn of the century may not have actually had a chance to see you fly a “dualie” (most likely a California Wasp), because much of your flying these days entails “Brian’s Big Toys.” How did all that come to pass? When did you get interested in SLKs, and especially the BIG ones? Yes, I pretty much only flew Wasp’s, you’d be right! It was a slow transition. I started collecting unusual kites, mostly for mass ascensions. Then they got bigger and bigger. 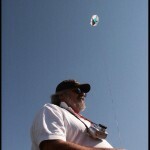 My buddy, Dan Whitney, was busy buying bigger and bigger kites too, and would sell me his not so big ones! I was silly to think that I could do both – fly dualies and singles and did try a few times…NOT! Ya just can’t – one or the other! My star was slipping anyway and I didn’t have the energy to learn the new stuff that was being done, and before I knew it, I had a van full of big kites! I do often wonder where my head is though… Those dualies are so light and easy to schlep around and pack away!! 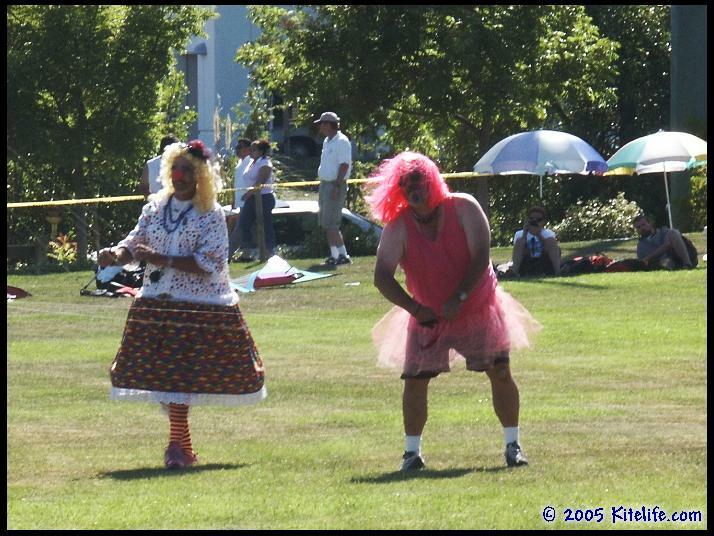 And somewhere along the line, you also got involved in several of the different kiting organizations too. Your website lists the AKA and BASKL of course, along with The Northern California Kite Club, the BCKA, So CoMe Fly, and the now-defunct SCSKL. We understand the necessity to join the AKA in order to compete, but tell us how you came to join the others. 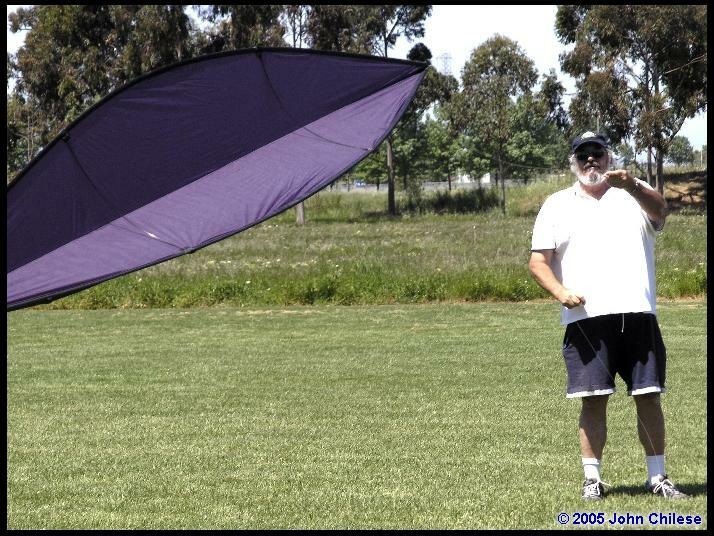 I was a founding member of BASKL and stayed on for 7 or 8 years, NCKC is our local Kite Club and before long I was a principal… more because no one else wanted to!! BCKA, Ray Bethell hooked me up with that club. The AKA Regional Director’s job came because Tom McAlister didn’t want to do it anymore, and I got elected to the job! 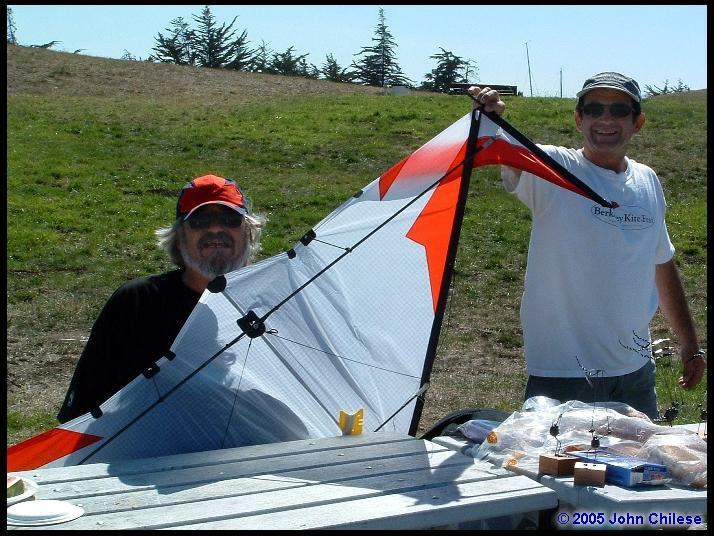 And we’d especially like to hear about you combining forces with some other folks to organize The Bay Area Sport Kite League (BASKL). How did all that occur, and what were the conditions that forced or allowed it to happen? BASKL came about through the ideas of Darrin Skinner. 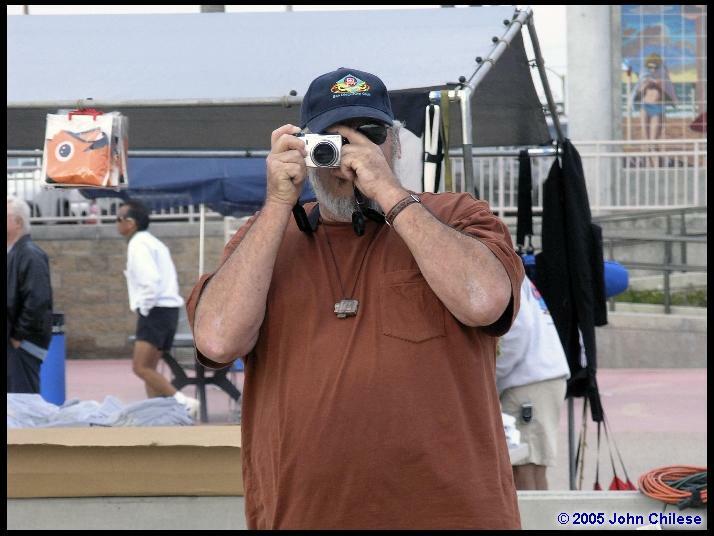 At the time we had lost 2 or 3 events here in California and it was getting harder ‘n’ harder to compete without traveling. We had a meeting at Greg Aronson’s apartment rec room and had an overwhelming response. We whittled the group down to the first board members and set about organizing our first event. That first event was great – and the rest is history! We’d also be interested to know how you came to run for the AKA Director spot for your region, and how and when that first occurred. What has being a Director meant to you, Brian? 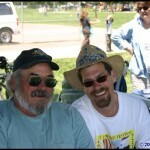 What are some of the notable events you’ve attended over the years? Yes, I know you’ve been to lots of them, but which ones stick in your mind – and why? WSIKF is my favorite by far (I’ve never done Wildwood because I do an event the same weekend). The entire town leans into the week-long event, zillions of kites, billions of kiters. One great week! Before we learned that the Oasis hotel in Mexico was owned by the largest drug cartel in Mexico and was a banned by the US as a place to go, a group of NCKC’rs and SDKC’rs would spend Thanksgiving week there. Usually great winds on the beach, always good shopping and eating. HA! You’re asking abut the time Dan whitney, Brian Blattel, and Deb Lenzen and I flew an 88 foot octopus from the top of the 150 foot high Point Arena Lighthouse… And nearly lost the kite when the wind shifted and increased to about 30 mph. One of the lines broke and that kite and pilot tried its best to go out to sea! It took several hours to get it down, but we finally did! That whole thing started at WSIKF. They have a mystery Ballet there and I got Tiny Tim’s “Tip Toe Thru The Tulips” for my tune. I hammed it up and everyone had a giggle. Then everywhere I went, someone in the crowd would be singing that song when they saw me… Even several years later! 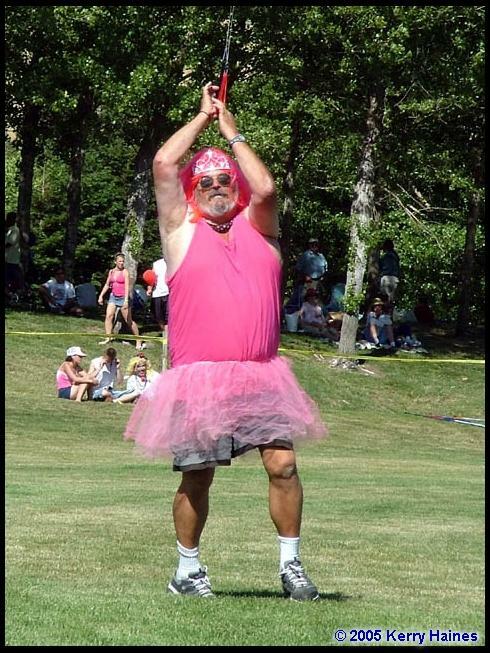 Then someone suggested I get a pink tutu and use that music… Well, thinking no one would ever find a pink tutu to fit ME, I said something stupid like, “Ok, if you can find a tutu to fit me, I’ll do it! 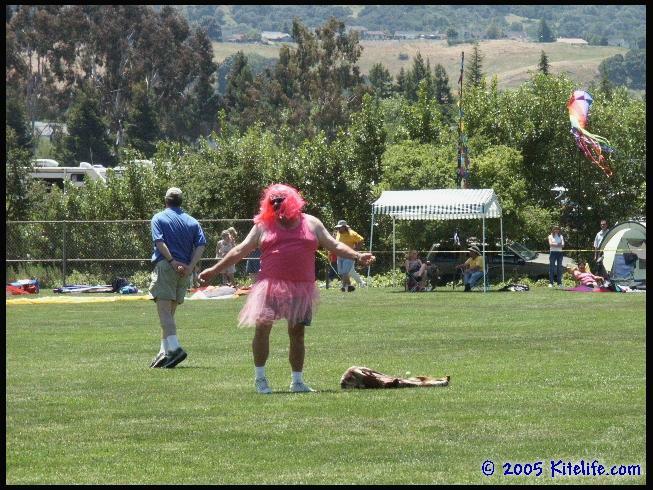 !” Well, Carol Churchill made a giant pink tutu and presented it to me at the San Ramon Art ‘n’ Wind Festival, SOOo there I was… Tip toeing around in a big pink tutu… (sigh!) 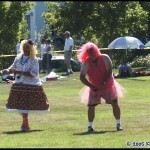 I dunno why every one loves to see a fat guy in a tutu! You’re also down in the books as the Organizer for a few noteworthy events. 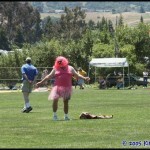 especially the San Ramon Annual Festival. How did that come to pass? 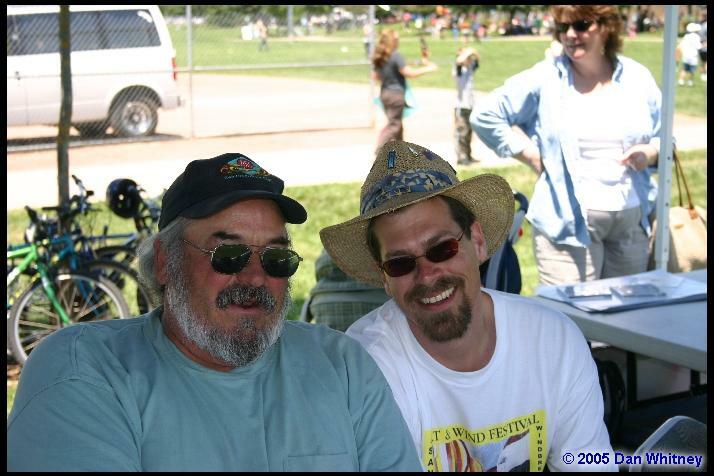 The San Ramon Wind Festival has been done by 2 other NCKC members. It was passed to me some 8-ish years ago. I also put the Golden Gate Challenge together, though now BASKL runs it the day of the event. 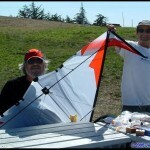 And, I put together the 4th of July Kite Festival at Point Arena (now defunct). I’m proud of both my sister and my son. Sharon is making her way in kiting with fighters, and, of course, Aaron has the “whack style,” tempered with smoothness and is better now than I am! Time to break away from past and present history and ask an “opinion” question. 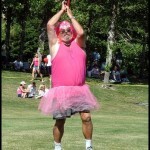 Do you think the sport of kiting will ever return to its “Hey-day” or even exceed those participation numbers? Will it ever become “Mainstream?” And what do you think we can do to help kiting grow as a sport? OH boy, if I knew the answers to these questions, I’d be famous!! The way it’s going, I’d have to say organized kiting will continue to decline. I think they’re still selling kites and there are new kiters, but the interest in ballet and precision is being replaced with the tricks. Kiters only want to learn tricks! Perhaps this new “tricks competition” will help, but I’m not so sure if many will try it in it’s current form… Keep infecting your friends and kiting will survive! 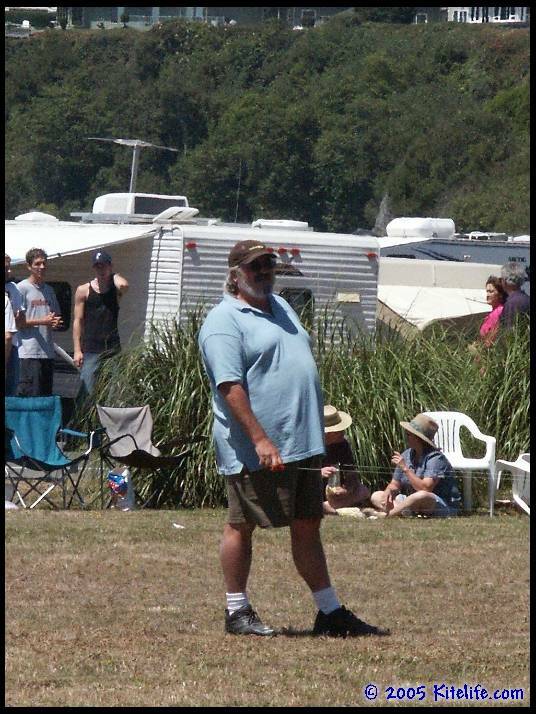 Finally, I guess it comes down now to us defining Brian Champie, the man – as opposed to the “kiting personality.” What do you enjoy doing outside of kiting, if anything? What gives you pleasure, and makes you happy? 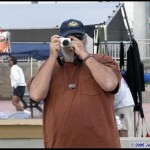 I don’t know if you can get my other hobbies to define me… At 55, I’m not sure who I really am! I guess I’ll know when I grow up! I’m a self employed contractor. This gives me the freedom to be as broke as I wish (play kites). I also have a large collection of antique clocks and enjoy restoring them. I have a complete repair shop in my house, and take in the occasional clock for repair. When I can’t do my regular work anymore, I hope to do clock repair work to pay the bills. Brian, Thanks SO much for taking the time to share all this information with us. 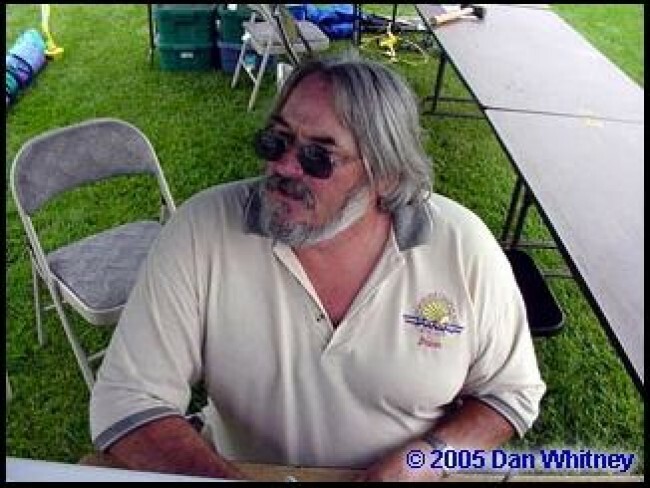 You’ve been such an integral part of the whole kiting scene along the west coast for so many years that you’re almost a fixture – and one of the great ones at that! We’re delighted to have someone of your caliber share this information with us. Thanks Loads! Thanks for the opportunity to tell my story. See ya out there somewhere! This entry was posted in 2005, Issue 43 (Jul/Aug), KL Archive and tagged brianna, champie, interview, sport kite.